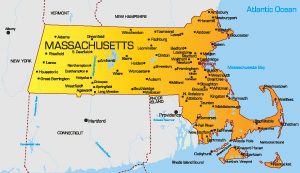 Massachusetts is officially named the Commonwealth of Massachusetts and is home to nearly 7 million people. There are three other states constituted as a commonwealth and they are Virginia, Kentucky and Pennsylvania. The capital, which is also the largest city, is Boston with a population of 625,000 residents. The bordering states are New Hampshire, Vermont, New York, Rhode Island, and Connecticut. The major highways in Massachusetts are I-90 (also known as the Massachusetts Turnpike), I-91, I-495 and I-291. Air travel is also a viable option for transportation in or out of Logan International Airport. Notable colleges in the state are Harvard University and Massachusetts Institute of Technology.